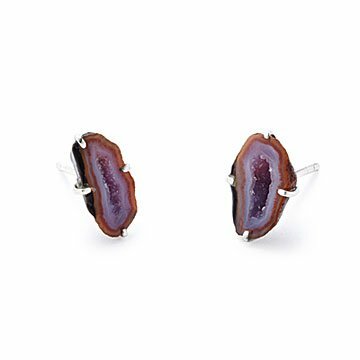 These stud earrings highlight the natural glamour of their amethyst crystals. These earrings from designer Karina Harris reveal the inner beauty of their materials. On its own, a geode looks like an ordinary stone, but Harris splits it open to reveal the rings of sparkling amethyst crystals within. The simple stud earring mounts allow the gem's natural brilliance to shine, making it the perfect accessory to elevate your look for a weekend getaway or a night on the town. Each geode has its own unique shape and coloring, making them a one-of-a-kind creation. Handmade in San Francisco, California. There's a sweet story behind Karina Harris' jewelry: her passion for jewelry making began when she first stepped into her local bead store, igniting a search for components she could forge into jewelry using her father's beekeeping tools. In her late teens, the San Francisco native set off to explore South America, Africa, and Asia, where she was inspired by the textiles, jewelry, and designs she discovered there. Karina believes in the feeling that a special piece of jewelry can give the wearer, that jewelry should be made to last, and that sometimes just one piece isn't enough.